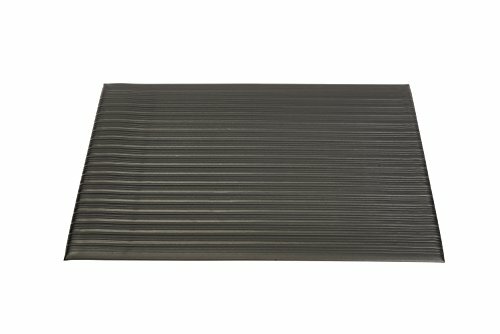 Why invest in an anti-fatigue mat for your standing desk? We standing desk geeks are a bit odd: most people standing up for their job on a retail floor or a factory line wish they had more opportunities to sit, and here we are standing up at our desks by choice! Well, for one, they feel great. 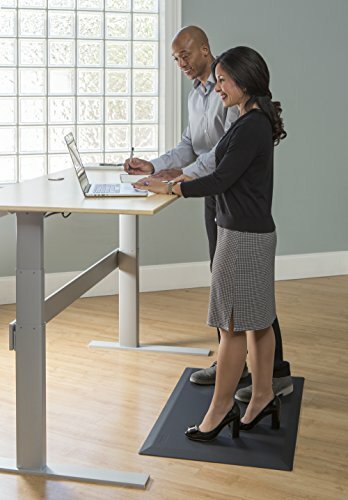 Standing all day can be hard on your feet, but standing all day on something squishy is pleasant and cuts down on some of the aches and pains, especially when you’re first getting started with standing at your desk. In the United States, OSHA, the Occupational Safety and Health Administration, recommends (but does not require) anti-fatigue mats for workers in a variety of standing jobs (and they think of everything). There’s good reason for that: anti-fatigue mats improve circulation and reduce strain and fatigue. 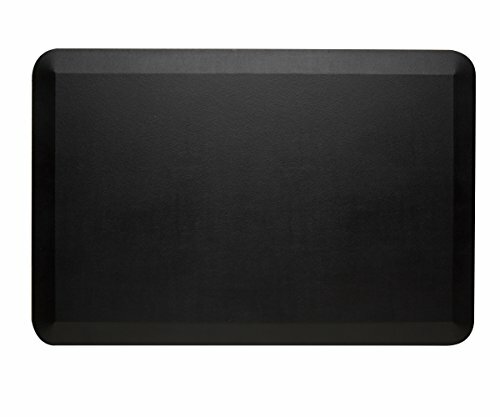 If you plan on standing all day, you should invest in an anti-fatigue mat. The right mat can improve your standing desk comfort, provided you also wear supportive shoes, change position frequently, and stand at your desk with good posture. If you take one thing from this review, it’s that you should buy a real anti-fatigue mat, not a carpet square or a repurposed welcome mat from your local home decor shop. Don’t be fooled into thinking you can get away with an anti-fatigue “kitchen mat”, those are meant for 45 minutes of scrubbing dishes, not 6+ hours of standing at a workstation. The mats in this review aren’t cheap, but they’re the right tool for the job. 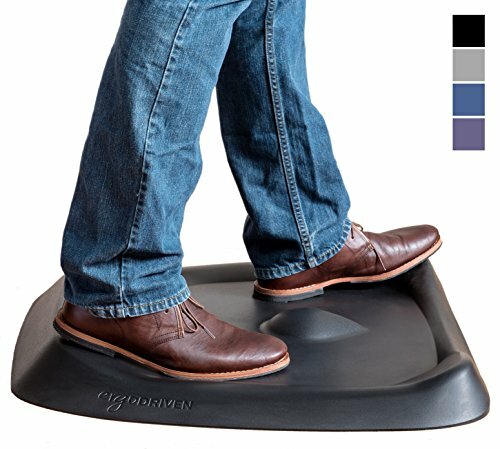 If you’re standing all day, you deserve a real anti-fatigue mat! The Topo mat by Ergo Driven is taking the standing desk world by storm – and for good reason. It’s so much fun to stand on! The manufacturer calls the nubs and edges “calculated terrain”. You can roll your feet against it all day and it’s like having a little foot massage while you work. 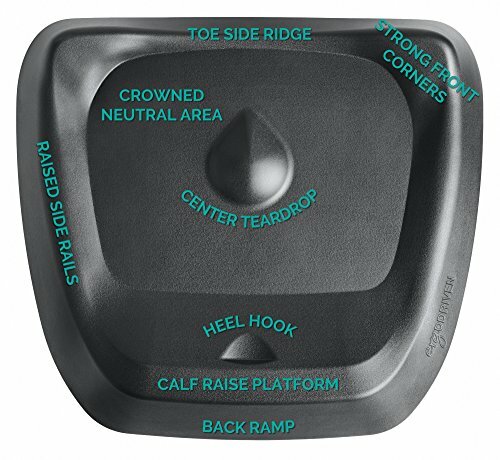 Use the “center teardrop” to massage your arches and the calf raise platform to stretch your calves. “Active standing” is so much better for circulation and comfort than just standing still for long periods of time, and the Topo mat makes it easy and fun. Another great feature? The Topo mat is large enough for the Bigfoots among us! 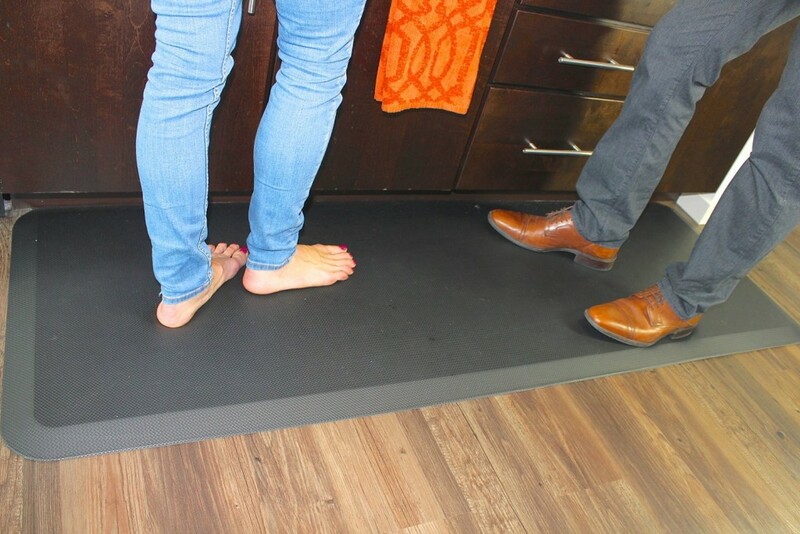 Users with feet up to sizes 16 (US) are reporting that their feet can fit entirely on the flat part of the mat. The overall dimensions of the Topo are: 26.25″ deep x 2.7″ tall (at the peaks) x 29″ wide. The mat comes in four colors and the manufacturer offers a whopping 7-year warranty. This mat is thick, firm yet yielding, supportive enough to use all day long, and durable enough to stand on while wearing shoes. Plus, we love rubbing our feet into the topological features. The Topo is our top choice for standing desk anti-fatigue mats in 2018 and we think you’ll quickly see why! If you’d rather get a flat mat, then the Cadillac of standing desk mats is the Imprint CumulusPRO Commercial Grade standing mat. This heavy-duty mat by Imprint doesn’t mess around. 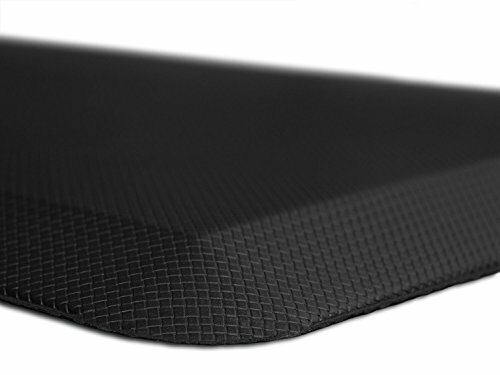 It’s thicker (3/4″), heavier (6.5 lbs), and more durable than virtually any other standing mat on the market. The edges don’t curl and have a nice bevel to discourage tripping on the edges of the mat. Even Microsoft chooses ’em, according to the manufacturer. Note: Imprint also offers the CumulusPRO Professional Grade mat, which comes in six colors, a few inches smaller on each dimension, and is slightly less rugged. CumulusPRO mats are made of a non-toxic, tear-resistant, anti-microbial material and have a non-slip bottom that can be used on a hard floor or a thinly carpeted floor. The mat is easy to wash with soap and water. It’s not recommended to place a chair of any kind on a standing mat (hence why it’s a standing mat, you know?). It’s one of Amazon’s best sellers and the same mat recommended by The Wirecutter. CumulusPRO commercial grade standing desk may be one of the pricier mats we checked out, but it’s a high performing, generously sized mat that will make your standing desk significantly more comfortable to use for hours on end. It comes in two color options: black and brown. Much like mattress preference, how you feel about its firmness will come down to your own preferences. Some people say it’s too soft; others say it’s like standing on concrete. What gives? It’s hard to articulate the softness of something through text alone, but we think it’s just right. It feels firm at first, but after a day of standing on it, the heavier duty support is appreciated. Also, you can squish your toes into it, which is oddly satisfying. Versus the CumulusPRO Commercial Grade mat, you lose 6″ of width and 4″ of depth with the CumulusPro “Professional” version, but you also spend about half as much money. The edge bevel is a bit smoother but the mat is just as thick and features the same cushion core technology. It looks like the CumulusPRO Commercial Grade mat with a different bevel, but there is more to it than that. This mat is slightly less supportive and has a different texture. What are the tradeoffs versus the pricier commercial version? You’d be surprised: Imprint markets this mat to look like the only difference is the beveled edge, but there’s more to it than that. Compared with the CumulusPRO Commercial Grade mat, the less expensive Professional version is slightly squishier (softer), has a different surface texture (some reviewers describe it as “oily” or “slippery”) and less supportive for long standing sessions. I think if you’re only standing for part of the day, this mat is a fine choice. If you intend to stand all day, every day, the extra cost of the CumulusPRO Commercial Grade mat is worth it. That’s just a few inches short of 6 feet wide! The extra-long Sky Mat mat is a beast: not quite 9 pounds but wide enough to stretch across even the biggest workstations and host a standing friend or two. Up-close look at the Sky Mat reveals a weave texture and slightly rougher edges than the CumulusPRO mats. The Sky Mat has a scaly “weave” texture which can collect small crumbs and particles, and since we tend to eat at our desks we favor the smooth Imprint CumulusPRO mats unless you specifically need a longer mat. Cleaning it is as easy as sweeping it or wiping it with a wet rag. If your workstation is extra-wide or you frequently show your work to colleagues (who inevitably have to stand at your standing desk with you) you might prefer a wider mat. The Sky Mat features a non-slip backing that makes it a good choice for hard floors, but it can also be placed on carpet with no slippage or reduction in its anti-fatigue benefits. Alternatively, check out the Smart Step Home Collection 72″ incher for your extra-long anti-fatigue mat needs. 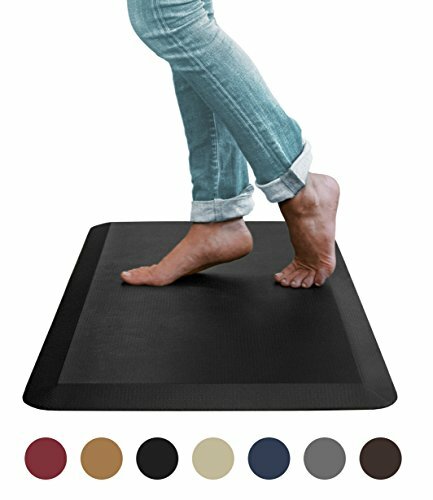 It’s a bit pricier than the Sky Mat but comes in more colors and is just as well reviewed. Prices vary (significantly, in some cases) by color, so be careful to check the price on the color you want. Obviously, it lacks the thickness and support of the CumulusPRO Commercial Grade mat, but at about the cost of an entree at a nice restaurant, you’ve got to expect a few compromises. Those compromises are to not use this mat as a standing desk mat, even though it currently sits in Amazon’s #1 best seller slot for “Floor Comfort Mats”. Not everything in life makes sense. The Genuine Joe anti-fatigue mat has an anti-skid back but the edges are a far cry from the anti-trip bevels seen on the mats recommended above. You can even see the edges curling up in the stock photo from the manufacturer! It’s thin and flimsy, and you might find more use for it as, say, a mat for placing under your Rock Band drum kit to help prevent floor damage from the kick pedal. 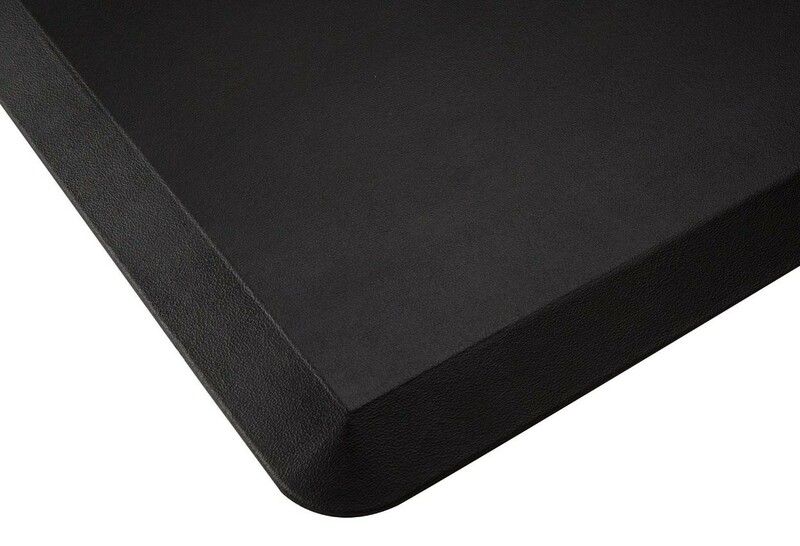 This mat isn’t meant for a standing worker trying to avoid fatigue and physical strain. Don’t get any old mat, especially if you plan to stand as much as possible at your standing desk. Look specifically for a mat designed for standing workers, not a kitchen mat or a rug that happens to feel kind of squishy. The difference might not be apparent at first, but over the hours (or days) you’d benefit more from a supportive mat designed for the job you’re giving it.